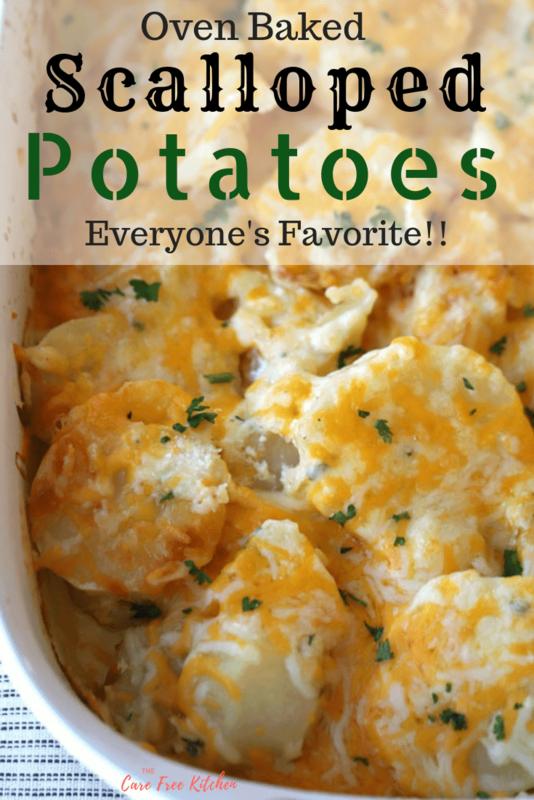 These Cheesy Scalloped Potatoes recipe is a family favorite! It’s the perfect homemade scalloped potatoes recipe for Easter, Christmas or any family dinner. 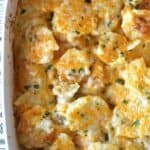 What kind of potatoes should I use to make scalloped potatoes? You can use almost any type of potato. 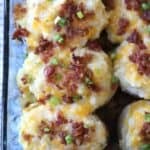 Russet Potatoes are what I used for this recipe but you can use Yukon gold or red potatoes too. Broth: You’ll notice there’s chicken broth in this recipe. 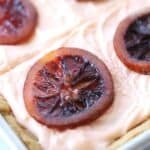 This will give it the moisture and flavor you love without as many calories. Win, win! Sour Cream: Sour cream will give it the creaminess and tart flavor you love in scalloped potatoes. Cheese and sour cream are the perfect combinations in this recipe. 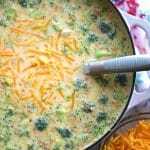 Cheese: I prefer to use on that’s already shredded because it simplifies the process a little but you can use just about any type of cheese. Some of my favorites are sharp cheddar, white cheddar, gouda cheese, or gruyere cheese. It’s also great to use some parmesan in this recipe. 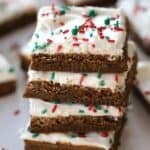 It has such a smooth but intense flavor and everyone loves it. Use a couple or mix your cheeses! Garlic: I also used garlic powder in this recipe, garlic salt to be exact. I’m all about substituting the powders to get the same flavor. 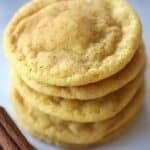 Onion: For this recipe, I like to add onion powder. You can the onion flavor without the hassle of chopping and caramelizing the onion. 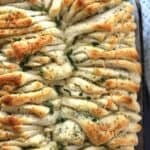 Thyme: I used fresh thyme in this recipe. It’s my favorite fresh herb. I have it growing in a pot right outside my patio door so I can access it all year round. If you don’t have fresh thyme, dried will work in a pinch too. Start by spraying your baking dish with non-stick cooking spray. This will help with the cleanup. Next, you are going to prepare your potatoes. You can choose whether you’d like your potatoes peeled or not. Russet potatoes have a little thicker peel so I’d suggest peeling those but if you are using Yukon Gold or Red Potatoes, they have a peel that is a little more tender. 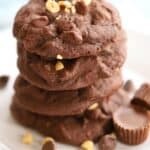 My kids are super picky with potato peels so I usually peel them but if you’re making this for adults, the peel is super pretty and I like the chewiness of them too. Slice the potatoes. You will want the potatoes a thin 1/8″-1/4″, as evenly as possible. Spread half of the sliced potatoes in the bottom of your greased baking dish. Pour half of the sauce over the potatoes. 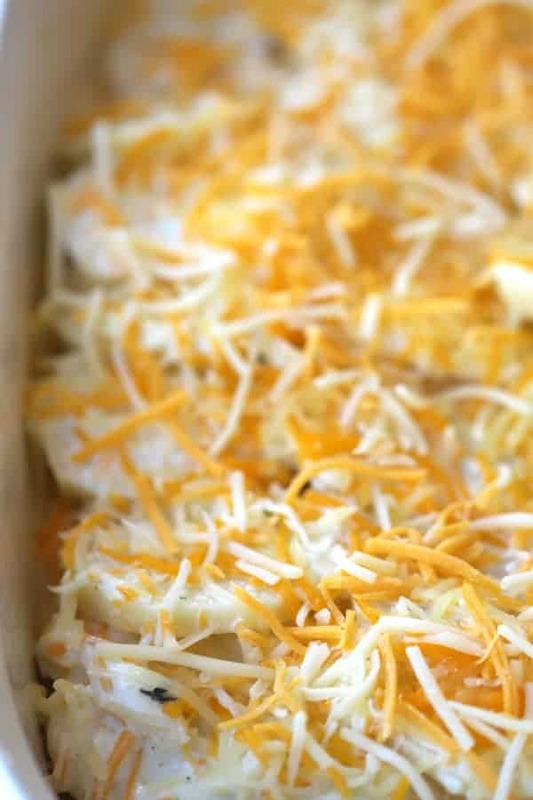 Spread the remain potatoes in the baking dish and add the rest of the sauce and the rest of the cheese. 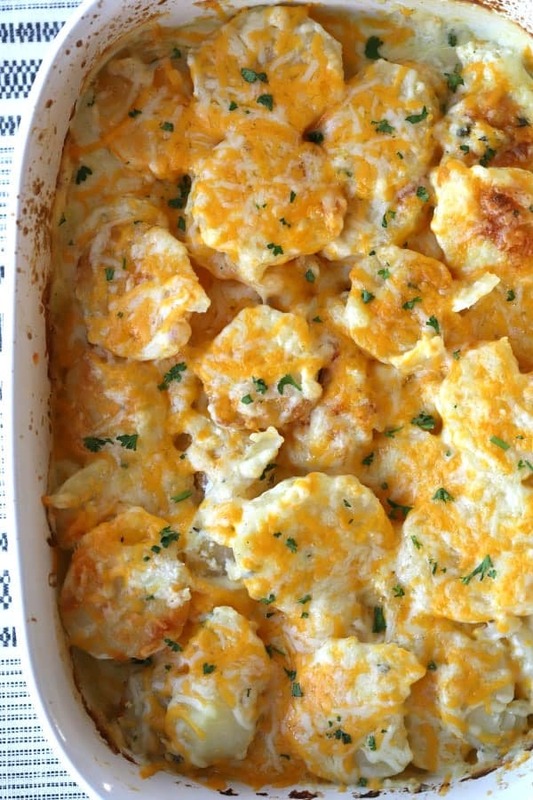 Bake in a 350-degree oven for about 1 hour or until the edges and top of the scalloped potatoes are golden brown and the potatoes are soft when poked with a fork. If the cheese becomes too brown on top, simply cover the baking dish with aluminum foil until the potatoes are tender when poked with a fork. Take the baking dish out of the oven and these delicious homemade scalloped potatoes cool for about 5 minutes before serving. You can use your favorite cheeses. Sharp cheddar, white cheddar, gruyere, and parmesan. Have fun with it! You can make these up to a couple days in advance. Add a little ham for another recipe variation. 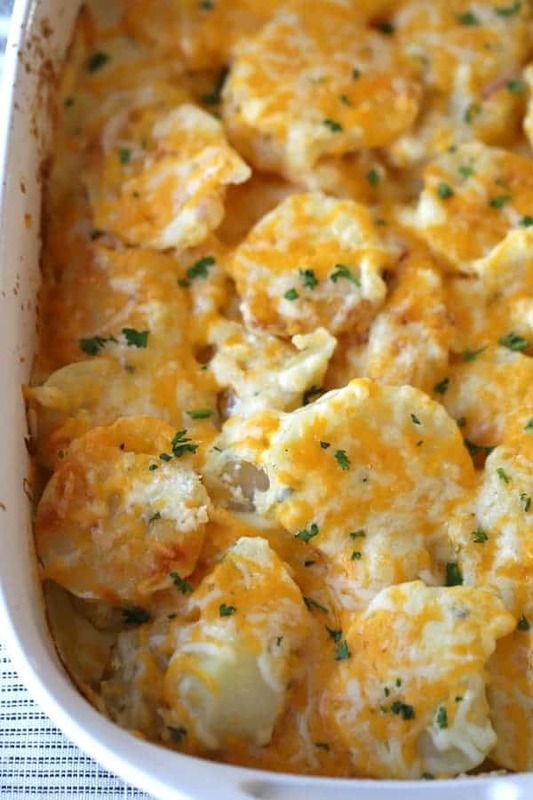 These Cheesy Scalloped Potatoes recipe is a family favorite! It's the perfect homemade scalloped potatoes recipe for Easter, Christmas or any family dinner. 1 tsp Thyme, fresh Fresh is best but dried will work in a pinch too. Start by spraying your baking dish with non-stick cooking spray. Peel the potatoes if desired. Slice the potatoes. You will want the potatoes a thin 1/8"-1/4", as evenly as possible. Spread half of the sliced potatoes in the bottom of your greased baking dish. Pour half of the sauce over the potatoes. Spread the remain potatoes in the baking dish and add the rest of the sauce and the rest of the cheese. Bake in a 350-degree oven for about 1 hour or until the edges and top of the scalloped potatoes are golden brown and the potatoes are soft when poked with a fork. If the cheese becomes too brown on top, simply cover the baking dish with aluminum foil until the potatoes are tender when poked with a fork. Take the baking dish out of the oven and let these delicious homemade scalloped potatoes cool for about 5 minutes before serving. Enjoy!